A man pushes his bicycle through flood waters near the Superdome in New Orleans on Aug. 31, 2005. Photo credit: AP Photo/Eric Gay. Ten years ago this weekend, Hurricane Katrina roared ashore on the Gulf Coast, killing more than 1,000 people (the true death toll may never be known). From the start, the tragedy had a powerful racial component – images of poor, mostly black New Orleans residents stranded on rooftops and crowded amid fetid conditions in what was then the Louisiana Superdome. Initial reactions to the government’s response to the crisis were starkly divided along racial lines. In a national poll conducted Sept. 6-7, 2005, a week after the storm made landfall, African Americans delivered a scathing assessment of the federal government’s relief efforts. Two-thirds (66%) said that “the government’s response to the situation would have been faster if most of the victims had been white.” Just 17% of whites agreed – most whites (77%) said the race of the victims would not have made any difference. 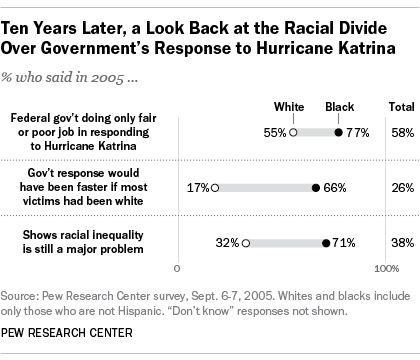 Just 19% of blacks rated the federal government’s response to Hurricane Katrina as excellent or good, compared with 41% of whites. And nearly three times as many whites (31%) as blacks (11%) said then-President George W. Bush did all he could to get relief efforts going quickly. Fully 74% of blacks said they felt depressed by what had happened to areas affected by the hurricane; nearly as many (71%) felt angry. Fewer whites experienced such strong emotions – 55% said they had been depressed and 46% angry. Blacks and whites also drew very different lessons from the disaster: Most blacks (71%) said it showed that racial inequality remained a major problem in the United States; most whites (56%) said that this was not a particularly important lesson of Katrina. A decade after the storm hit, racial differences in attitudes about the impact of Hurricane Katrina linger. Earlier this month, the Kaiser Family Foundation and NPR released their fourth post-hurricane survey of New Orleans residents. For the most part, both black and white New Orleans residents are optimistic about the city’s future. But while 70% of whites say the city has mostly recovered from Katrina, just 44% of African Americans agree. Note: This is an update of a post originally published Aug. 28, 2013.